"Alexander The Great was the most tolerant conqueror in the world. As he was conquering countries, he never ruined other buildings, he respected the culture of the conquered and wanted from the authorities of every country that he conquered, to pay him taxes." Alexander's father has well trained him in the political and military tasks, as soon as he reached 18. At the age of 20, after the assassination of his father (in 336 BC), Alexander became king of the ancient Macedonian state. Alexander the Great ruled the ancient Macedonian state for 13 years, since 336-323 BC. In the period of his authority Macedonia became the most powerful country in the region and developed the well trained ancient Macedonian army Phalanx. During the period of his authority, some Greek city-states tried to establish authority over Macedonia, but Alexander defeated them as his father did at Chaeroneia in 338 BC. During this offensive, Alexander the Great totally ruined Thebes, the greatest power in ancient Greece. 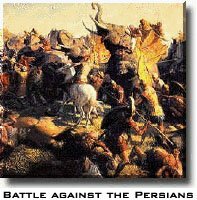 After this victory, the Persian empire was totally destroyed. The Macedonians entered the biggest Persian cities, Babylon, Suza and Persepolis. 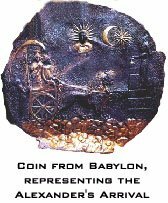 The Babylonian priests proclaimed for king and Alexander re-built the temple of the Persian god Marduk. In the spring of 327 BC, Alexander and his army marched into India invading Punjab as far as the river Hyphasis (modern Beas). At this point the Macedonians rebelled and refused to go further. The greatest of Alexander's battles in India was against Porus, one of the most powerful Indian leaders, at the river Hydaspes. In July 326 BC, Alexander's army crossed the heavily defended river in dramatic fashion during a violent thunderstorm to meet Porus' forces. The Indians were defeated in a fierce battle, even though they fought with elephants, which the Macedonians had never before seen. Alexander captured Porus and, like the other local rulers he had defeated, allowed him to continue to govern his territory. Alexander even subdued an independent province and granted it to Porus as a gift. In this battle Alexander's horse, Bucephalus, was wounded and died. Alexander had ridden Bucephalus into every one of his battles in Greece and Asia, so when it died, he was grief-stricken and founded a city in his horse's name. Alexander's next goal was to reach the to travel south down the rivers Hydaspes and Indus so that they might reach the Ocean on the southern edge of the world. The army rode down the rivers on the rivers on rafts and stopped to attack and subdue villages along the way. During this trip, Alexander sought out the Indian philosophers, the Brahmins, who were famous for their wisdom, and debated them on philosophical issues. Alexander the Great became legendary for centuries in India for being both a wise philosopher and a fearless conqueror. One of the villages in which the army stopped belonged to the Malli, who were said to be one of the most warlike of the Indian tribes. 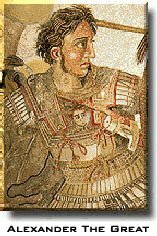 Alexander was wounded several times in this battle, most seriously when an arrow pierced his breastplate and his ribcage. The Macedonian officers rescued him in a narrow escape from the village. 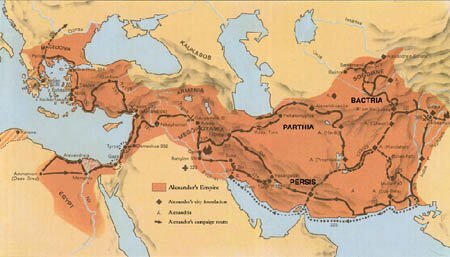 Alexander and his army reached the mouth of the Indus in July 325 BC and turned westward for home. "Map of Alexander's Macedonian empire"
In the spring of 324, Alexander held a great victory celebration at Susa. Alexander the Great and 80 close associates married Iranian noblewomen. In addition, he legitimized previous so-called marriages between soldiers and native women and gave them rich wedding gifts, no doubt to encourage such unions. When he discharged the disabled Macedonian veterans a little later, after defeating a mutiny by the estranged and exasperated Macedonian army, they had to leave their wives and children with him. 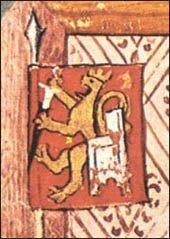 Because national prejudices had prevented the unification of his empire, his aim was apparently to prepare a long-term solution (he was only 32) by breeding a new body of high nobles of mixed blood and also creating the core of a royal army attached only to himself. After his death, nearly all the noble Susa marriages were dissolved. He established training programs to teach Persians about Greek and Macedonian culture, and he married Roxanne, a Persian princess. 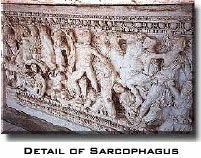 "Relief presentation of the battle by the river of Granicus (334 BC) against the Persians, led by Alexander The Great (The Archeological Museum - Istanbul, Turkey)"
We will probably never know the truth, of Alexander's mysterious death, even though new theories are still coming out. Alexander the Great, the Macedonian king and the great conqueror, died at the age of 33, on June 10th, 323 BC. Three days earlier, on the 7th of June, 323 BC, the Macedonians were allowed to file past their leader for the last time before he finally succumbed to the illness. 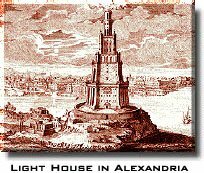 Alexander died without designating a successor. Alexander's death, marked the end of the great ancient Macedonian empire, that carried on in the hands of Philip 3rd Arrydeus and his child Alexander 4th. Alexander the Great died as a god and as a legend, he had 32 years and created an empire, like nobody before and after him, did. After his death, Alexander the Great was becoming more and more famous. "Alexander the Great was not just a Macedonian king, but was a Macedonian and was speaking Macedonian." Alexander of Macedonia, the son of Philip 2nd, came out of the land Hetean and defeated Daruis, the persian and indian tzar and strengthened himself in Ellada (Greece), instead of Daruis. Alexander the Great lead many wars, conquered many places and defeated many rulers.